Congressman Rogelio J. Espina (in blue with white polo), together with Assistant District Engineer Alfredo L. Bollido (in white longsleeve) Hon. 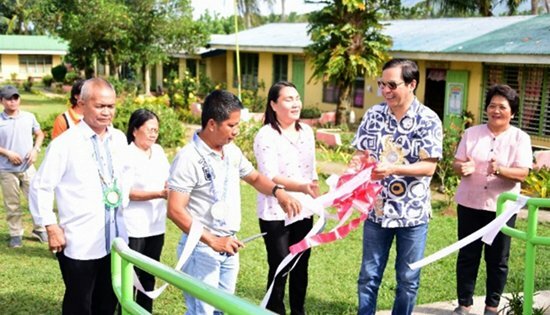 Nelson Corpin (in gray polo shirt) and Principal Bella Salentes (in pink ¾ sleeve) lead the Ribbon Cutting for the newly completed 1-storey 2-classroom School Building in Cabibihan Elementary School. NAVAL, Biliran – A newly completed 1-storey 2-classroom in Brgy. Cabibihan has been turned-over to the teachers and administration of Cabibihan Elementary School by the Department of Public Works and Highways (DPWH) Biliran District Engineering Office (DEO) on February 11, 2019. Present during the turn-over ceremony was Congressman Rogelio J. Espina, Assistant District Engineer Alfredo L. Bollido, Caibiran Mayor Eulalio Maderazo, the contractor of MKB Builders, School Principal Bella Salentes, teachers and parents of the pupils. Ms. Marilyn Gervacio, Public Schools District Supervisor (PSDS) who also graced the event gave words of challenge for the school building users. “I am posing a challenge to the teachers and parents to maintain the usefulness of this building for a number of years so that it can still be used by our children in the coming years”. Meanwhile, Ms. Salentes expressed gratitude to Congressman Espina and to the DPWH for the school building project and hopes for more school buildings to rise in the school. “We are hoping for more buildings to come because it is projected that more school children will flock to our school after today, next years and the years to come because of the rapid population growth of Brgy. Cabibihan”. Children of the recipients of the on-going housing projects of the National Housing Authority (NHA) in Brgy. Cabibihan is anticipated to flock because of the geographical location of the school. The new school building with two classrooms and adjoining toilets are to be occupied by Kindergarten and Grade 3 pupils. This building is designed to provide the pupils a well ventilated, reliable and disaster resilient school buildings.